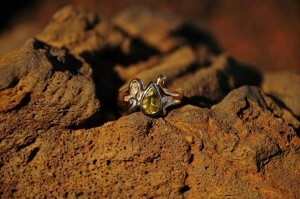 Rick Hartley created a stunning custom engagement ring that features a yellow-green, pear-shaped Chrysoberyl stone. 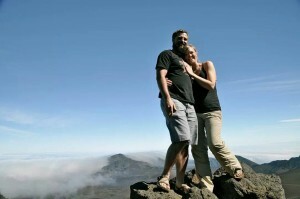 Heather Littke and Andrew Claiborne pose high atop Hawaii’s Haleakala Volcano shortly after becoming engaged. Heather Littke and Andrew Claiborne met by chance in December 2012 at a restaurant in Olympia. 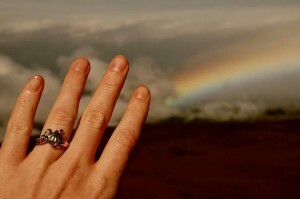 What began as a search for a bite to eat would eventually end (with a whole new beginning) amid a marriage proposal at the top of a Hawaiian volcano. “We were both there on a whim,” says Heather, who had wandered into Cascadia Grill and grabbed a seat at the bar, craving a hamburger. Andrew sat down two stools away. Luckily, she didn’t have to. Another patron came in and sat in the empty chair between them. He was talkative and pulled Heather and Andrew into a conversation. “We realized we worked in the same building,” Heather says. The coincidences didn’t end there; they were the same age and had moved to Olympia at the same time. The man they now call their cupid (they’ve not seen him since that night) convinced them both to join him at a comedy club, followed by karaoke. The couple celebrated the second anniversary of that serendipitous night last December, shortly after becoming engaged. The fact that Andrew planned to propose wasn’t a complete surprise to Heather – but when he would pop the question was. “Rick came up with some amazing drawings and we both decided on one that caught our eye,” Heather continues. Being the one who will wear the ring forever, she appreciated being part of the design process. After making a wax casting of the custom ring and having Heather try it on, Rick made a few small tweaks to the design, per her wishes. “It was so beautiful,” Heather says, of seeing just the wax version. “I was really excited to have something that was one of a kind.” She wouldn’t see the finished piece until the engagement. “The ring is totally me – I can’t imagine anything more perfect,” Heather says of her Hartley Jewelers original piece. The finished ring is yellow and white gold with four diamonds on the left and two on the right; the center stone is a gorgeous yellow-green, pear-shaped Chrysoberyl. 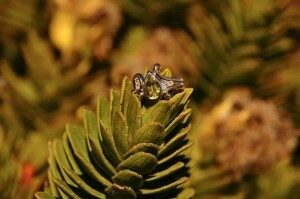 Andrew will have a matching thick band of yellow and white gold with an oval Chrysoberyl in the center. During the trip to Maui, Andrew suggested they go to the Haleakala Volcano. Andrew got down on one knee and prepared to ask Heather to be his wife. She goes on to say that the trip was fantastic in and of itself, but Andrew’s marriage proposal really took the cake. 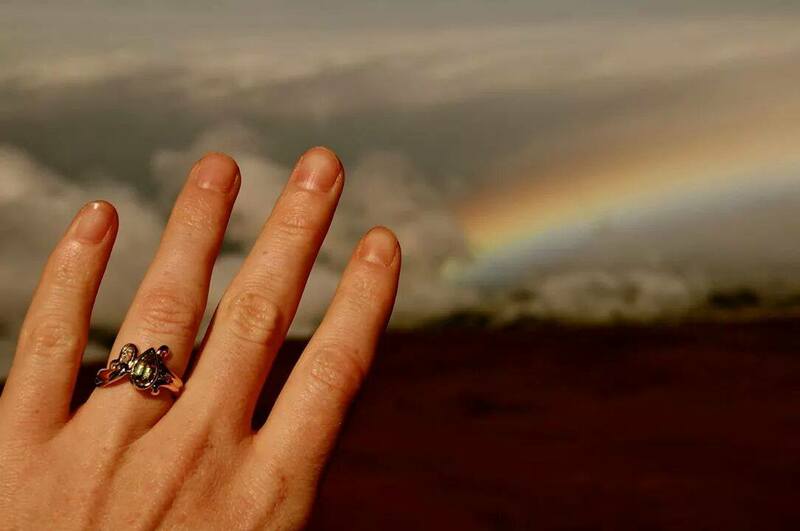 Heather and Andrew met in December 2014 and got engaged in Hawaii two years later.